What is serendipity? Wikipedia says it is a "fortunate happenstance" or "pleasant surprise". For us, attending Events and Conferences can be such an occasion for serendipity since you always can come across some valuable and interesting ideas, products or persons. At the beginning of 2016, we are busy planning which conferences and events NexPCB will attend. You know, it is not exaggerating that there is tons of tech events and conferences with tons of goals all over the world. And we are lucky to find a blog created by Loggly, who has made a comprehensive list of DevOps events and conferences related gatherings in one place and help DevOps lovers a lot. It inspires us so much because we also cannot find such a comprehensive list of Hardware related events, and we believe we are not alone! So we started compiling the information in a doc according to Loggly's way, and we're sharing it with you now to help you make your event schedule for the year! 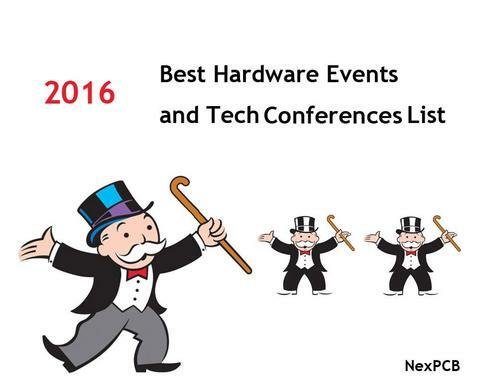 If you are hardware makers, businessmen, manufacturers or tech lovers, here you will find proper events to attend coming up 2016. Besides the below list, we also compile the list of hardware incubators, makerspaces and hardware meetups. Keep attention to these groups as they will held activities frequently, which may benefit you a lot!